At one time, there were over two hundred cigar factories gracing our city’s skyline, giving Tampa the moniker of Cigar City. Unfortunately, there are now only twenty-four of them remaining, five of which are abandoned. The remaining nineteen historic cigar factory buildings are currently being utilized as offices, churches, schools, and warehouses. 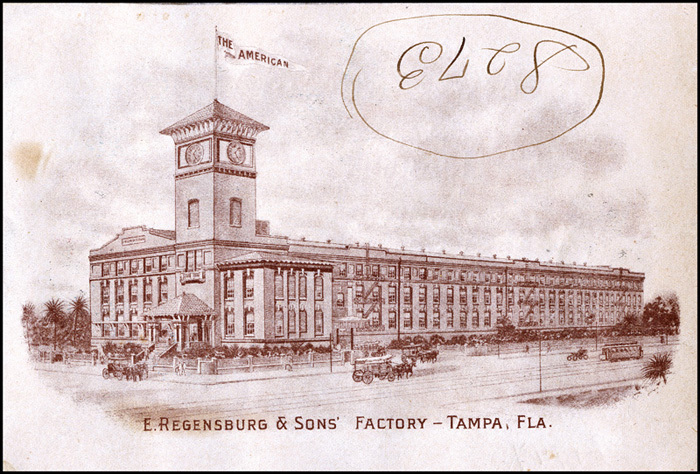 The Regensburg Cigar Factory, a massive 97,000 square foot building, is one of a few cigar factories that is currently used for cigar-related businesses, and it is the only factory in Tampa that still manufactures cigars. When it was built in 1910, this factory had enough seats for over 1,000 artisan cigar rollers. Unfortunately, machines began to replace the human rollers during the Great Depression when cigars became luxury items few people could afford. Due to mechanization and decreased demand after World War II, the factory’s workforce had decreased to around 300 employees. In 1951, the building was abandoned when Regensberg moved his operations up north. Two years later, J.C. Newman, owner of a successful northern cigar company and currently the oldest family-owned cigar maker in the United States, bought the former Regensberg factory and relocated his entire operation to the building. 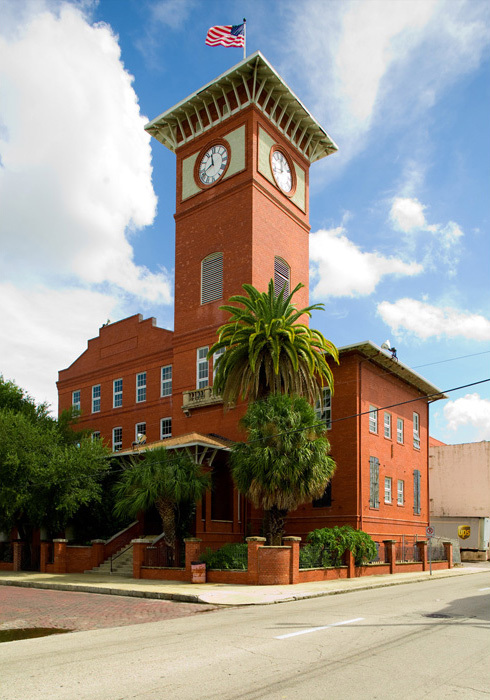 The factory’s iconic bell tower, nicknamed El Reloj, Spanish for “The Clock”, had become an integral part of life for Ybor City residents. For generations, families would depend on the clock and its 1,500 pound bell for the time. Unfortunately, the Newmans were not aware of the bell’s significance and had it silenced. Over the years, the clocks’ mechanics as well as three of the four clock faces had broken. 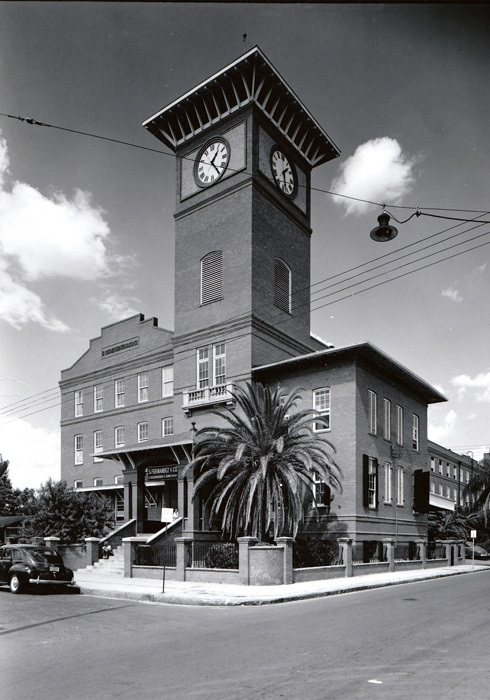 In 2002, the Newmans restored the clocks and bell which, after sitting silent for fifty-years, now chimes again for all of Ybor to hear. An old postcard of the factory. Another view of the clock tower. The original wooden clock face dating back to 1910. Is that the same palm tree? If so, it looks like it only grew about 10 feet in 50 years?? I have been fascinated by these magnificent old buildigs for years now. As a former Termite Salesman, I have been able to inspect and exlore some of them, especially this one. They still stand as a silent, yet graceful testement to Tampa’s past and the golden age of Cigars. It must have been very interesting to be able to explore these huge factories. Bryan, phenomenal job! I think this building is one of the top 5 of Tampa’s most beautiful structures. As for the tree, I also noticed the change in height. I’m no expert, but I think it might be a King Sago palm. King Sagos grow verrrrrrryyyyyy slooooooowwwwwly. Sorry to disagree, Dan, but I think it’s a Canary Island Date Palm: http://en.wikipedia.org/wiki/Canary_Island_Date_Palm. They, too, are slow growers and they’re all over Tampa (I grew up there and am long overdue for a visit). I grew up there just one block away on Owen ST. My wife worked there in the late 60’s. What a testament to preservation.